The President’s commentary is emblematic of the ideas that (1) government is responsible for ensuring fairness for everyone, and that (2) Jesus’ words may be understood to support government’s function to that end. Besides the general difficulties in defining fairness and determining its scope, there are significant problems in understanding the biblical record as supportive of such a role for government. Three of those problems include (1) the problem of legislating morality and the scope of government, (2) the “menu” problem in handling Jesus’ words, and (3) the unsolvable problem for government. This first article will discuss the problem of legislating morality and the scope of government, and will be followed by two articles handling the other two difficulties. The goal of these articles is to consider how biblical Christianity is related (or unrelated) to government in the task of social justice, and what is a biblical perspective on social justice and on individual and collective responsibilities to that end. In applying Jesus’ words and other religious or biblical principles to government-mandated social justice, first, there is the difficulty that comes with legislating morality. All legislation has to do with morality—whether it is the morality of a few or the morality of the masses—legislation is inextricably connected to the idea of morality. In light of this reality, it would be disingenuous to suggest that government has no right to legislate morality—indeed it does, but only to a point. The particular challenge in view, then, is regarding the kind of morality to legislate. How far should government go in such legislating? If certain behaviors are prohibited, then should the beliefs or thoughts that lead to those behaviors also be illegal? Who gets to determine what behaviors (and ideas) should be considered immoral or illegal? In considering social justice, the Declaration and Constitution make no provision for government to ensure happiness—or even fairness. The Declaration begins with these words: “We hold these truths to be self-evident, that all men are created equal, that they are endowed by their Creator with certain unalienable Rights, that among these are Life, Liberty and the pursuit of Happiness.” Granted, the verbiage here does not necessarily limit the rights of all men to simply these three, but it is significant that no other rights are discussed, either explicitly or implicitly. Now, it is worth noting that the true weight of these rights goes beyond their simple terms. For example, John Locke’s Second Treatise on Government contends that the right to life necessarily includes the right to personal property. (How can one protect his life if he is disallowed any property, such as clothing food, etc.? )2 Hence it can be argued that such things such as medical care, housing, or employment are rights—or at least necessary conditions in order for the three basic rights (life, liberty, pursuit of happiness) to exist. I would suggest, however, that something that is restrictive of one’s three basic rights cannot be a right for another individual. For example, if I have the right to employment, then someone else does not have the right not to hire me. If I have the right to a house, then someone else does not have the right not to provide one for me. If I have the right to medical care, then someone else does not have the right not to treat me. Locke’s idea of personal property, on the other hand, would not restrict the rights of others. Locke does not suggest that we simply have the right to property, but rather that we have the right to retain the property we have lawfully earned—and there is a substantial difference between those two ideas. Consequently, it is a legitimate understanding that the three basic rights have a limited scope, and that human rights are (1) divinely granted, and (2) limited to the principle of universality (“rights” must be equally held and cannot infringe on the rights of others). The role of government is described by the Declaration as limited “to secure these rights.” Likewise, the Constitution describes its purpose as six fold: “…to form a more perfect Union, establish Justice, insure domestic Tranquility, provide for the common defense, promote the general Welfare, and secure the Blessings of Liberty to ourselves and our Posterity…” These purposes, having been prefaced by the Declaration should not be understood as expanding the rights to be secured, but rather should be viewed as an explication of how those rights (described in the Declaration) are to be secured. For example, to “promote the general Welfare” does not define the role of government in the lives of its citizens. Rather the terms should be understood in light of the earlier document. Promoting the general welfare, in this context, means that government is responsible to ensure that the rights of its citizens are secured (from foreign and domestic threats). Consequently, applying religious principles—even biblical ones—to the role of government beyond what the Declaration defines and the Constitution specifies, would be to step outside of the framework of the Constitutional form of government and to step into more of a theocratic governance. Except in this case, God is not the head of this theocracy. Instead, those who would use His words for their own purposes (well intentioned or otherwise) take His place in that role. Notably, this is not a separation of church and state issue—it is even more foundational than that. Once government assumes the role of God, then its power and influence is unrestrained in the lives of its citizens, and it no longer is “for the people,” nor can it accomplish any of the six purposes for which the Constitution was written. For better or for worse, if we are under a Constitutional form of government, we must play by its rules—and so must the government. When it fails to do so over a period of time, the Declaration mandates revolution: “But when a long train of abuses and usurpations, pursuing invariably the same Object evinces a design to reduce them under absolute Despotism, it is their right, it is their duty, to throw off such Government, and to provide new Guards for their future security.” Even in this statement the security of rights is the primary issue. Further, if government recognizes other rights beyond those identified in the Declaration, then from whence do those rights come? If citizens have, for example, a right to employment, then from where does that right originate? The Declaration identifies three rights (life, liberty, pursuit of happiness) as being self-evident, since they are derived from God and do not cause any essential conflict between individuals. A right to employment, on the other hand, would need a great deal of explanation, having no self evident origin and causing essential conflict between individuals (if one has the right to be employed, then another at some point does not have the right not to employ). Such a “right,” if there is one at all, would be derived not in God, but in government. If government can grant rights, then government can restrict them—government can control them. Government then becomes the arbiter of human behavior beyond the letter of the Declaration and the Constitution, and its jurisdiction is unbounded. Whether or not an unlimited kind of government is inherently harmful is not the issue here (I believe it is gravely harmful, unless governed by a Perfect Leader, but I am not arguing that point here). The issue is that an unbounded government is not at all consistent with a constitutional one. When government takes on the role of God (able to grant inalienable rights), one government ceases to exist and another begins. In short, a government mandating social justice—by taxation or other means—has stepped outside of its well-defined parameters, and has moved toward despotism, even if doing so on well-intentioned grounds. 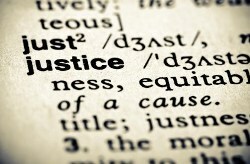 Social justice may or may not be a legitimate agenda (I hope to address this question through a biblical lens in a future article), but governmental involvement—especially justified on theological grounds—presents tremendous challenges in justification and consistent application. Still, at this point we should consider an important question: Isn’t government uniquely equipped to handle societal difficulties in a way that individuals are unable to match—even if only due to the Leviathan’s inherent administrative structure for organizing and dispersing resources? I would suggest that the Bible mandates both individual and collective responsibility, but the collective responsibility is not borne by government, but rather by another entity. Who that entity is and how it is to handle this responsibility is in part the topic of the next article. 1 CBS News, “Obama links raising taxes to Christianity,” http://www.cbsnews.com/video/watch/?id=7397339n, February 2, 2012. 2 John Locke, Second Treatise on Government, Chapter VIII, Sec. 95-99 and 119-122. In this article, the Bible is a minor player. The big players are the Constitution and Declaration. really needs to be changed, IMO. This article, for example, could not have been written a thousand years ago, even though the Bible was complete then. You might title it: The Convergence of Bible, America's Documents, Government, and Social Justice. The article is well written and good, but it disappointed me because I anticipated something else. Since this is a series I am certain much of this first part is forming part of the foundation for more developed later arguments. You might be right. I am a bit sensitive to people confusing the Declaration/Constitution with Gospel truth. Maybe I need to chill out.